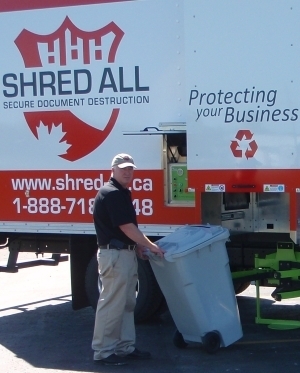 Shred All is a small family-run and locally owned company servicing Southwestern Ontario, Canada. Our unmatched level of service begins with highly professional customer service representatives who are uniformed, bonded and insured. Our containers are provided free of charge with regular shredding services. All our shredded paper is recycled. There is no contract to sign. Our on-site mobile secure shredding and document destruction service will impress you with its affordability, security and professionalism. We offer competitive, up-front pricing. We provide a service that is fast, efficient and confidential. We offer a variety of container options for your shredding needs. challenges of your company information disposal policy. A retired dairy farmer with more than 20 years of experience, Jim Miller is a customer-focused entrepreneur who places great importance on building relationships. Shred All is a small-town success story, embodying Jim’s principles of providing top quality service, while giving back to the community. And, Shred All’s clients agree! With no service contracts, and accessible staff, Shred All meets a need that much larger organizations simply aren’t able to fill. Jim also places an emphasis on customer education. Since founding Shred All, Jim has set out to raise awareness of the importance of data protection and prevention of identity theft. Contact Shred All, and Jim and his team would be happy to speak to you about your needs.